Liv Design is run by Scott Johnson, a freelance creative designer with over 23 years experience working with both local and international clients in a wide variety of market sectors including Food and Drink, Leisure, Automotive, Retail and Education. Liv Design specialises in graphic design, branding and packaging design. This new Glass Sound Speaker (or LSPX-S2 Glass Sound Speaker to give it it's full name) from Sony is a thing of beauty. It's so simple looking, so clean and elegant. This is like something you'd expect from Apple. The wireless Bluetooth speaker delivers features a glass tube that vibrates to give exceptionally clear 360 degree sound anywhere. 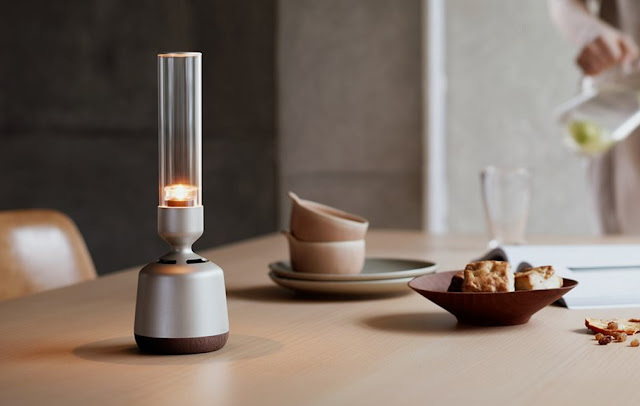 It also features a built in light with 32 stages of brightness and a Candlelight mode that flickers just like a real candle. Perfect for your steampunk styled loft apartment or your Florence Nightingale themed party. The speaker can be controlled by the Sony Music Centre app and lasts around 8 hours on a single charge. Toilet paper... Not the most interesting thing to blog about you might think? Well think again. Let me introduce you to Who Gives a Crap. This eco-friendly and ethical company has been around since 2013 but have been getting some good press recently. They use 100% recycled environmentally friendly materials, donate 50% of their profits to help build toilets in countries where access to toilet facilities is poor, and they don't use inks, dyes or perfumes. And if you buy in bulk, it works out the same as other market leading brands. They also produce tissues and paper towels. Personally I like their irreverent tongue-in-cheek style and their colourful patterned pack designs. It's great to see such a fresh approach and ignore the taboo of the subject. You can have fun and still have a serious message. Why not have fun with your product? 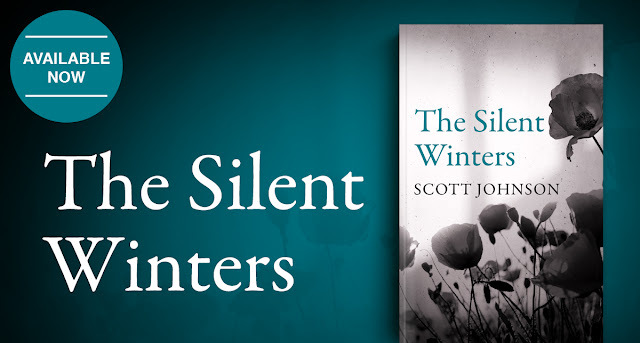 I'm over the moon to announce that my third novel, 'The Silent Winters', is now available. The final book in 'The Wolf Hound and the Raven' trilogy is available in print and digital formats. The story picks up four years after the events in the second book, 'Return to Havenmill'. Daniel, Mary and Alexander are once again thrown into a grim and violent world filled with political treachery, greed and dark secrets. Destiny forces them towards a Europe that stands upon the precipice of war and chaos. Friends are scattered. Families are taking sides. It was time to dust off the previous Liv Design brand and give it a smarter new look for 2019. In comes a new palette of fresh, modern colours and a simple font for an uncluttered feel. The logo uses a palette of three colours to bring a touch of variety and diversity. Fonts are Avenir for print and Helvetica for online. A new Liv Design website has also been designed with a more visual look. This is very much a 'work in progress' website! Very often I find things like this naturally evolve and change with use. There's also a portfolio page to finalise (I'm still not happy with how it interfaced) but if you'd like to see some examples of work I can email you a pdf. There are lots of special edition packs, limited edition products and tie-ins between brands in the retail market nowadays, each hoping to attract more customers from a different market. Some of these work and some don't. 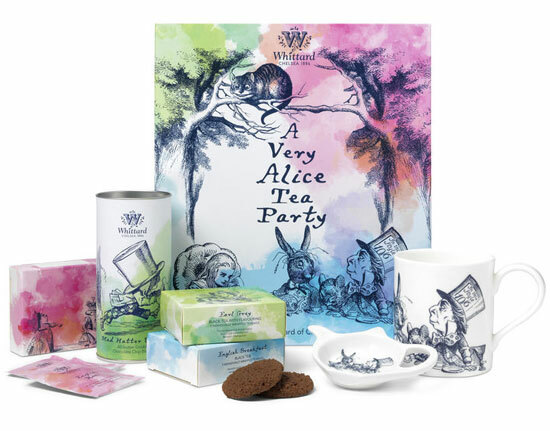 This collaboration, however, between tea and coffee specialist Whittard and Lewis Carroll's Alice in Wonderland works perfectly on many levels. Firstly, they're both quintessentially British. They are both timeless classics from yesteryear, each conjuring up the magic and majesty of childhood and days gone by. They create a sense of nostalgia and evoke memories of our childhood. It's comforting and relaxing. In the 1865 fantasy novel Alice attends a tea party, hosted by tea loving character Hatter and his friends. The connection between the tea brand and the books is obvious and makes perfect sense. Love motorbikes? Love beer? Love heavy metal? Love great graphics? Then you're in luck! Shoei have launched a limited edition version of their X-Spirit III helmet as worn by Peter Hickman in this year's Supersport race in the Isle of Man TT. The Iron Maiden official beer is a collaboration between the heavy metal band and Robinson's Brewery who sponsor Peter Hickman and the Smiths Racing Team. Limited to 666 (what else?!) 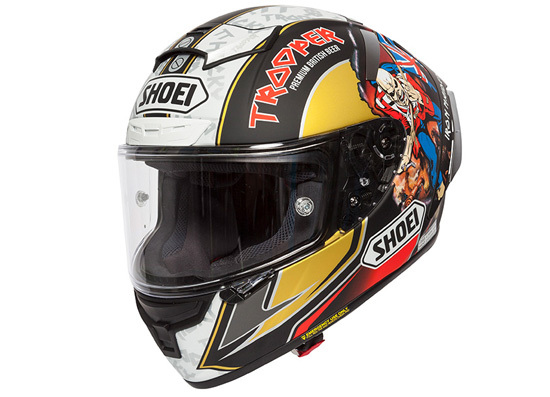 the helmet also comes with Trooper merchandise, a limited edition A3 Trooper canvas art print encased in a printed metal presentation tin and a Trooper pint glass. All for just £799.00. Available to pre-order now with deliveries in November 2018. Do you hanker for an old style typewriter? Do you miss the clunk of a proper keyboard? Then you'll love this retro style keyboard from Azio. There's definitely an element of steampunk to it, and it looks absolutely stunning. It's inspired by vintage style typewriters but modernised with a backlit mechanical keyboard. This new one is a wireless bluetooth version. The keyboard surface comes in either real leather or wood depending on which colour you go for. 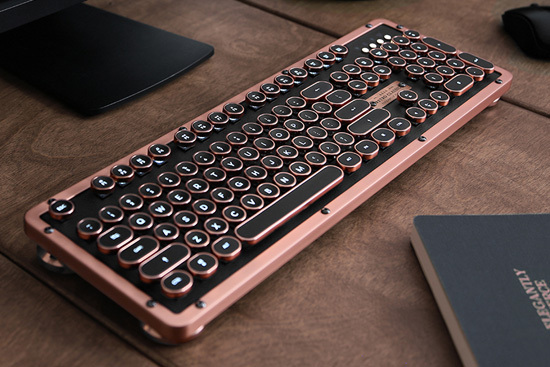 Onyx: black leather with black chromed frame Posh: white leather with copper matte frameArtisan: black leather with copper matte frameElwood: walnut wood with gunmetal matte frame This has to be the best keyboard I've ever seen. If only Apple made a copper Mac to go with it... I'm done with all the dull grey polished metal rubbish, bring me some copper tech! 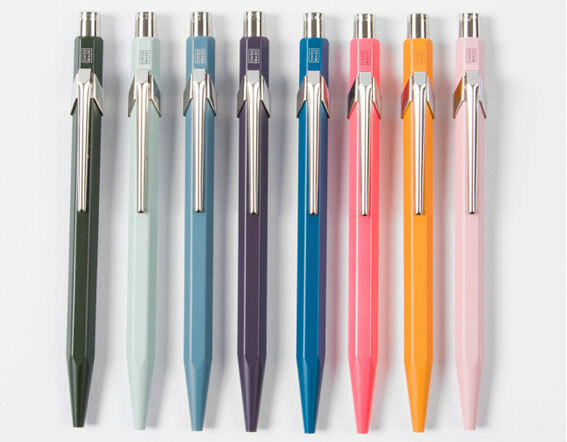 Fashion icon Paul Smith has teamed up with Swiss pen and pencil maker Caran d'Ache once again with a follow up to the stunning Edition One range of pens. The first collaboration last year commemorated the company’s 100th anniversary. The new range, simply called Edition Two, features new colours and are available individually or as a special eight pen collector set. The sleek tins feature Paul Smith's iconic Artist Stripe pattern and an embossed relief of the classic pen. The hexagonal bodied Caran d’Ache 849 pen was first released in 1969. The eight new colours are available for £35.00 each or £290.00 for the presentation case.